I was born in Boston, MA. Grew up in Lexington, MA. Went to UMass Amherst. I’ve lived in the Boston area for all of my adult life. I’ve been cursed with creativity for as long as I can remember. I know I was drawing lots in Kindergarten, making comics in first grade, and it went on from there. When I was in fourth grade I self-published a comic magazine and sold subscriptions to kids in my class. I kept drawing in Jr High and High School but that was when I also discovered the guitar. I began playing in ninth grade, got pretty good. By the time I graduated high school I was playing in bands and knew that I had to pursue rock in a serious way. But first I went to UMass Amherst and got a BA in English. After that, I moved to Boston and began playing professionally. This all culminated with The Bags. You can read about it here. We recorded albums, toured, enjoyed a certain level of indie success. In the early 90’s, after The Bags broke up, I returned to drawing. This was when I started Rock School, a comic that I went on to produce for 23 years. I also learned how to draw with a mouse, using early Macs and crude-by-today’s-standards software like Macromedia Director. I got a job at an educational software company where I developed some design skills, learned to animate, and worked on some exciting projects. Then, dotcom times, I began freelancing. My skills and interests branched out in a number of directions. I produced much animation, often using Flash. The Bags reunited and recorded two more albums. I learned to model objects and animate in 3D. I learned to edit video. 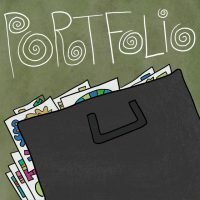 I did illustration, design, writing, and voiceover work. I continued drawing comics. I started a comic called Small Blue Yonder in 2013 and have since produced about 1500 strips and counting. I enjoy selling Small Blue Yonder books and artwork at comic festivals. I’m working on a long form comic about Konkorr, one of the Small Blue Yonder regulars. I’m also preparing a 200+ page collection of Rock School comics for publication. You can see a list of some of the projects I worked on over the years, and companies I worked for, via LinkedIn.